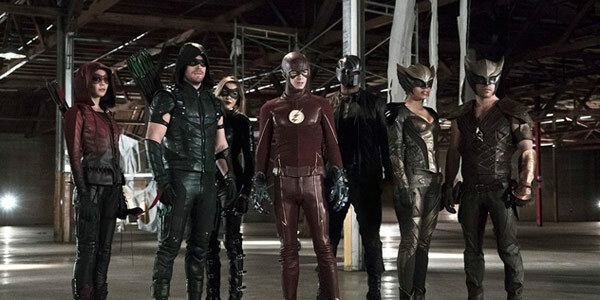 A couple of years ago when The CW added The Flash to its TV lineup, the network realized it had a unique opportunity to do a two-episode crossover connecting the worlds of The Flash and the network’s other DC Comics drama Arrow. The event was a huge success, so much so that The CW decided to repeat the crossover event this TV season. Now, it’s becoming an annual thing for the network and CW head honcho Mark Pedowitz revealed at the CW’s upfronts today that the four returning DC Comics TV shows will be putting together a mega-crossover featuring the leads of all four shows joining forces. Next season, Arrow, The Flash, Legends of Tomorrow, and now Supergirl will join forces in our annual crossover event, our biggest ever. First and foremost, this news makes me wonder what sort of villain The CW will have to get permission to use to be a foe worthy of that many superheroes at once. Obviously, the network is staying mum about what is coming, but in a conference call prior to the upfronts, Pedowitz also asked fans to “imagine” what the episode will look like (via EW), so that’s exactly what I am doing. So far, the network is only saying the giant crossover will come in December, which is when major crossovers have aired in the past. It's a good time for them, as TV is wrapping up for the winter around then and the networks are looking for memorable TV moments to tide people over until stuff is back at midseason. Of course, crossovers aren’t simply relegated to the crossover event. The current three CW/DC shows have all shown a penchant for having characters pop up randomly in programs that aren't their own. In addition, it was huge news earlier this year when the production team and two networks figured out a way to get Barry Allen to hop over to CBS where he met Kara Danvers and had an adventure in a whole other universe. It was a smashing success. Of course, now that Supergirl is officially a CW property that will be shooting in Vancouver, achieving crossovers should be far easier.